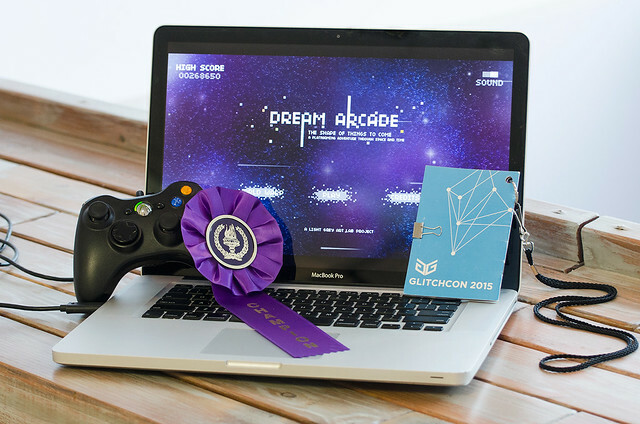 Dream Arcade wins Best Visual Design award at GlitchCon! Huge news! This weekend we were honored to take home the award for Best Visual Design for Dream Arcade from MinneCade, a showcase of locally-made videogames at GlichCon! A massive congratulations to all the artists involved, and everyone who helped make Dream Arcade a reality! This is everyone's award, you all earned it! The awards were voted on by the public at GlitchCon. We had a hugely positive response to both Dream Arcade and Great Personality during the event, we were ecstatic that were were able to share and connect with so many people at the event. MinneCade was packed with incredibly talented creators, friendly faces, and beautiful, outstanding videogames (seriously, go check them out! ), the thought of winning anything never crossed our minds! It's not lost on us that a project with dozens of collaborators won an award voted on by an audience of hundreds of videogame fans and creators. Community is what Light Grey Art Lab is all about, and we couldn't be more humbled to win this award, and we want to thank everyone involved! Shout it from the rooftops! Make sure to check out everyone involved on here!